Can concussions cause lifelong problems? It is not unusual for a patient to report concussion-related concerns to me. Some tell me that they are worried their memory has been declining due to an injury suffered years ago. Others may share recent car accidents, sports-related injuries, or run-ins with kitchen cabinets. It can be frightening when a person perceives change in themselves, but is not certain whether a minor error at work or temporary forgetfulness is just a normal slip… or a permanent effect of the head injury. In fact, a common cause of stress following a concussion is worry regarding symptoms. This is why education to health care providers and the public regarding concussion is so critical. Anywhere from 1.6 million to 4 million Americans suffer sports- and recreation-related concussions annually. 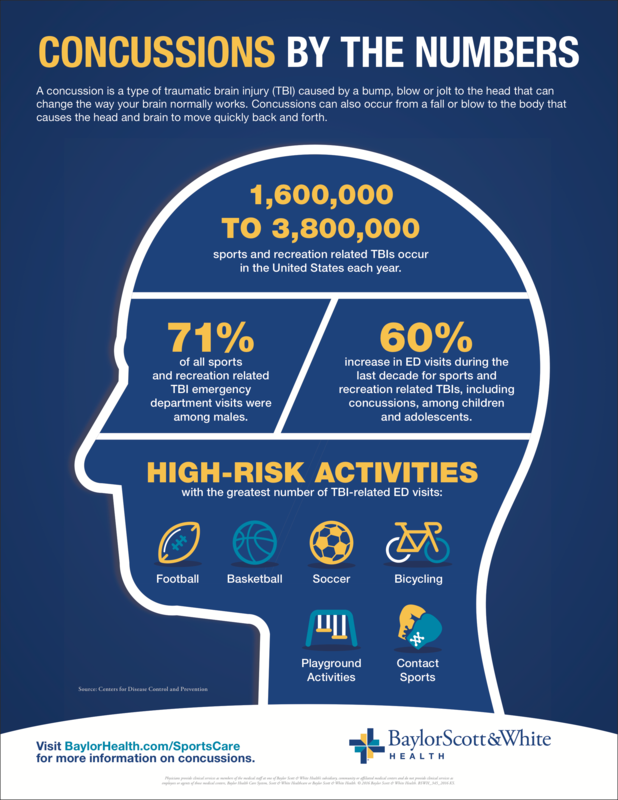 Anywhere from 1.6 million to 4 million Americans suffer sports- and recreation-related concussions annually. However, a large proportion of concussions go unreported, partly because the symptoms resolve so quickly for some. For others, it may be because they did not recognize the symptoms. Without immediate identification and treatment, serious and permanent complications can develop. Emotional or behavioral problems: irritability, anxiety, depression, fluctuations in mood, apathy, impulsivity. It is natural that these symptoms would feel frightening initially. However, they are due to the brain working hard to heal from bruising, inflammation, and changes to nerve fibers and blood vessels. Fatigue following the injury can also be a source to many cognitive and emotional symptoms. Typically, uncomplicated concussion symptoms resolve within three months of the injury. In fact, most people with this type of concussion will experience symptom resolution in 7–10 days and are able to return to their usual activities without any problems. This is why rest is so important in the initial 2–5 days, followed by a gradual increase in the intensity of work/activity load, or time spent in household, work, academic, and sports activity. There are some people who have a history of multiple concussions or who are at risk for prolonged recovery, including a history of migraines, depression or anxiety, attention-deficit hyperactivity disorder, or learning problems prior to the injury. When that is the case, it is important that this person be seen by a physician, neurologist, or neuropsychologist who specializes in concussion treatment. If a person’s symptoms do not appear to improve after one and a half weeks or they worsen over time, they should seek referral to a concussion specialist from their primary care doctor, as this can be a sign of more severe brain injury. Population surveys contribute to information about whether people seek medical treatment after concussion, and gauge people’s views about participating in contact sports after concussion. However, findings from a recent Truven Health Analytics-NPR Health survey should be interpreted with caution, because groupings of the sample did not consider age groups that tend to be most vulnerable to brain injury. Also, data can be biased purely based on who responds to surveys. For example, the percentage of people reporting long-term symptoms after concussion in that survey was much greater than that in the general population. A great deal of alarm and media attention has developed surrounding chronic traumatic encephalopathy (CTE). Though not solely attributable to head trauma, CTE is a neurodegenerative disease thought to develop following repetitive brain trauma — not a single concussion. Current knowledge surrounding CTE is primarily based on single-person studies or those with fewer than 15 participants. Though some clinical features have been identified, it’s unclear whether they can strictly be attributed to CTE in sports players (Baugh et al., 2012; Mez et al., 2016; & Stern et al., 2011). More importantly, not all individuals who are exposed to brain trauma develop CTE. Even those who have made a full recovery following concussion can struggle with fear and perception of impairment. This is why evidence-based education regarding concussion symptoms, treatment and recovery patterns is critical. Education enables early diagnosis, comprehensive management, and appropriate referral to improve a patient’s health outcomes after concussion.